he completed 32 commissions, only four of which were for architects other that J L Pearson (two of the commissions were for W D Caröe, a former pupil of J L Pearson). Amongst those Pearson commissions were works for Westminster Abbey, Lincoln Cathedral, Peterborough Cathedral, Bristol Cathedral, Rochester Cathedral, Sydney Cathedral and of course Truro Cathedral. It is clear that at some point J L Pearson had come across Hitch (perhaps at Thomas Nicholl’s studio?) and admired his work and perhaps suggested that he could guarantee work to allow Hitch to strike out on his own. The great majority of Nathaniel Hitch’s work was in or on church buildings. He was fortunate to work at the tail-end of the Gothic Revival movement in the late nineteenth century. This movement had seen a huge number of new churches being built together with a large number of restorations and so there was a plentiful supply of commissions in this niche market. 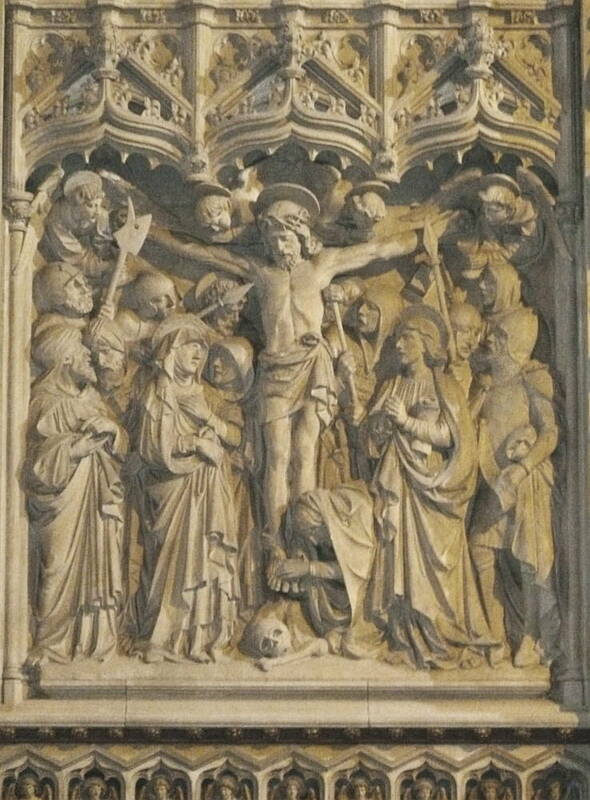 Of the 32 commissions, a quarter were for the sculpting of a Reredos (8), and indeed throughout his career he specialised in this most demanding of sculpture (27% over his entire career). In an obituary note about Hitch in The Times, Henry Philip Burke Downing (1865-1947), one of the later architects with whom Hitch worked, describes him as "an able and scholarly sculptor...," some of whose "best work was done when he was well over 80." Downing concludes, "He made many beautiful things, working all his days cheerfully and quietly in devotion to his art." — GPL and JB. Downing, Henry Philip Burke. "Mr Nathaniel Hitch" (obituary note). The Times. 1 February 1938, p.16. Times Digital Archive. Web. 3 January 2013. “Nathaniel Hitch Architectural Sculptor and Modeller.” Truro Cathedral website. Web. 12 August 2011.